Malopolska is one of Poland’s 16 administrative provinces (wojewodztwo), with Krakow as the capital city, and comprises 8.3% of the country’s population. It has its own provincial parliament and the executive, albeit both with limited powers. The Malopolska province makes up the chief part of Poland’s larger historical region of Malopolska bordering on the Ukraine to the east and Slovakia to the south, and on the Polish regions of Slask to the west and Mazowsze to the north. It is an area of charming beauty, with copious medieval towns and castles dotting the hillsides and the Carpathian Mountains covered with lush vegetation. A perfect place for those fond of diverse scenery with great walks, hikes, skiing, biking, fishing, camping out in the open, etc. The Malopolska province is placed right in the center of Europe and makes Poland’s south. The region takes up the upper Vistula river basin. Half of the province lies 500 m or more above sea level, including the highest Polish peak, Rysy (2499 m), in the scenic Alps-like range of the Tatra mountains. Tatry Mountains. 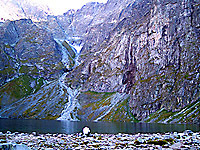 Czarny Staw (Black Pond), the austere sister lake of the nearby gorgeous Morskie Oko. Services flourish, industry carries on, and agriculture lingers on in the Malopolska province. Five universal banks have their headquarters here (namely in Krakow) in addition to over 100 local cooperative banks. Further 25 big banks operate in the province via their branches, outposts of multinational giants as Deutsche and Citicorp in that number. Some 246,000 industrial jobs account for 26.5% of the province’s total, with metals, steel, machinery, chemicals, tobacco and wearable goods being the staples. Among others, the Malopolska province is home to Europe's fourth biggest maker of cables (Krakow's Tele-Fonika), Europe's third largest producer of synthetic rubber (Oswiecim's Dwory), and the world's second biggest maker of roof windows (Nowy Sacz's Fakro). The high-tech gets high profile by day in the Malopolska province that already boasts Poland’s biggest computer maker, most-visited internet portal and largest fiberglass cable producer as well as Motorola’s European R&D center. Besides the local media Malopolska is home to the nation’s most popular radio network and the biggest regional TV station. It has one special economic zone (Krakow Technological Park, meant for major high-tech investments), 4 enterprise incubators, 3 commercial-fair grounds, 8 higher economics schools. Malopolska's accounts for 5.5 percent of Poland's exports. In 2003 the province's businesses sold abroad goods worth over 2.6 billion euros (or 808 euros per capita). Machines made up 30.4 percent of of the exports value, steel and other metal products 16.4 percent, plastics 7.3 percent, motor industry 6.5 percent, chemicals 6.2 percent, foods 5.7 percent, and paper 4.7 percent. The European Union accounted for 60.6 percent of the Malopolska exports with Germany as the main importing nation with its 27.8-percent share, while combined Eastern Europe bought 29 percent. Over 857,000 ha of arable land takes up 56.6% of the provinces territory divided among 222,500 farms–average 3.2 ha per farm. The Malopolska province is the fourth most popular destination of FDI among Poland’s regions in absolute terms. Over 70% of its $1.5 billion intake went to Krakow. Germans were investing in the Malopolska province most often, yet Americans outspent everybody. Major investors proved Germany’s Hypo-Vereinsbank and Deutsche Bank 24 (banking), US Philip Morris (tobacco), Croatia’s Pliva (pharmaceuticals), France’s Electricite de France (power generation), Coca Cola (beverages), Turkey’s Rumeli (cement) and Denmark’s Carlsberg (beer). Foreign-controlled companies provide some 45,000 jobs, about 8,000 newly created. Krakow’s Balice International Airport is Poland’s second biggest. There are 1002 km of national, 1540 km of provincial, and 6483 km of county roads in the Malopolska province. Four border passages lead abroad, to Slovakia and farther south to Austria, Hungary, France, Italy, Switzerland, the Balkans, and so on. The province is also crisscrossed with 997 km of railway lines, and has a cross-border rail passage. The Malopolska province embodies Polish prime tourist destinations, be it summer or winter. There are such obvious musts as Krakow, Tatra Mountains, Auschwitz, Wieliczka or Jura. At the same time the best hiking, skiing, bird-watching, biking, water sports, fishing, sightseeing, etc. can be found in the region. And the Malopolska’s abundant mineral-water and thermal springs together with bracing climate gave rise to many health resorts. Also agrotourism (i.e. tasting peasant life in comfort) proves ever more popular. Plus colorful and varied folklore. The Malopolska province boasts more wildlife sanctuaries than any region in Poland. Its six national parks – Gorce Park, Babia Gora Park, Ojcow Park, Pieniny Park, Tatra Park and Magura Park– cover 37,678 hectares, i.e. 2.5% of the province’s territory. Additional 2,300 ha form 80 wildlife reserves, while 157,000 ha make up 10 landscape parks. And some 650,000 ha rank as the protected landscape areas, which amounts to 42.5% of the Malopolska province. Woods cover 432,000 ha, i.e. 28.5% of the province, of which about 210,000 ha are protected forests. Area: 15,144 sq. km, 22 counties (3 municipal), 182 communes, 52 cities (25 under 10,000 and just one, Krakow, above 500,000), 2,635 villages. Population: 3,2 million, 212,4 per sq. km, growth 0.23% a year, 58.6% school age and younger, 14.3% elderly, 50.6% urban. Unemployment: 6 percent of the workforce in May 2017 (3.3 percent in the city of Krakow). Infrastructure: 9,025 km of roads, 997 km of railway lines, 18,5 phone lines per 100 inhabitants, 85,500 beds in 86 hotels and 2,300 other lodgings (1999), 886,155 apartments with 56,071,490 sq. meters of floor space. Health: 45 hospitals with 17,235 beds, 67,200 spa patients a year in 66 sanatoriums. Higher Education: Over 150,000 students of nearly thirty universities. Copyright © 2002-2018 by MAREK STRZALA. All rights reserved.